Light NE in the morning, later turning N and increasing. Nets open 06.30-14.30, netmeter hours approx. 2800. Playback on Garden Warbler and Grasshopper Warbler through the night, Tree Pipit, Meadow Pipit, Grey Wagtail and Goldfinch during the day. Ringed: Sparrowhawk 1, Tree Pipit 3, Meadow Pipit 17, European Robin 2, Reed Warbler 1, Common Whitethroat 3, Garden Warbler 6, Blackcap 2, Willow Warbler 6, Pied Flycatcher 1, House Sparrow 2, Tree Sparrow 1, Chaffinch 1, Greenfinch 2, European Goldfinch 1, Eurasian Siskin 3, Lesser Redpoll 3, Reed Bunting 1. Total = 56. Also 10 controls, including a Blackcap not from Revtangen. 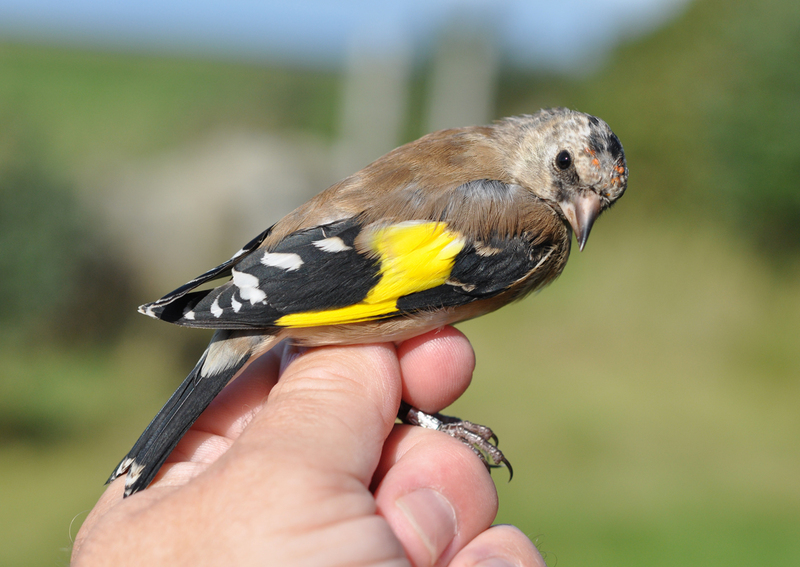 The first Goldfinch of the autumn was trapped today.